We report an off-pump technique to perform atrial septostomy under transesophageal echocardiography (TEE) guidance using thoracoscopic scissors. Our technique is possibly a simpler way to perform septostomy without CPB and its adverse effects. 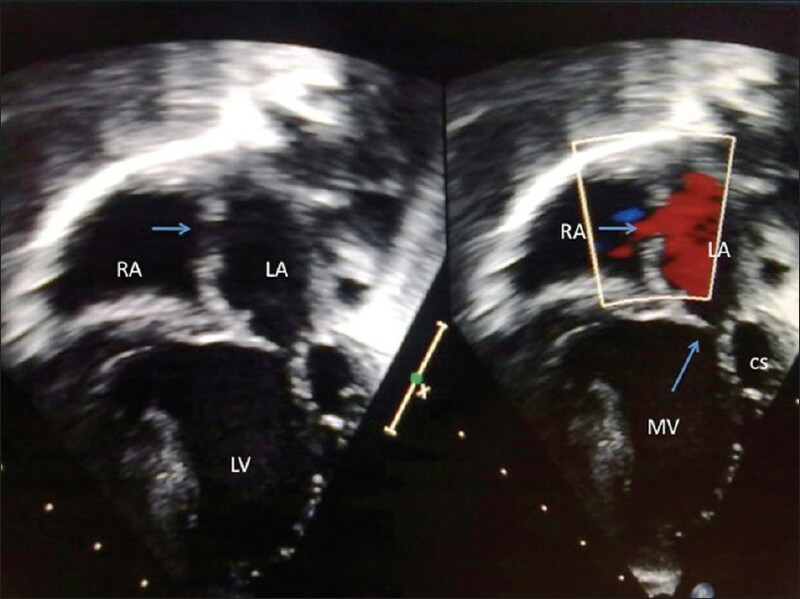 An 8-month-old female child with single ventricle physiology (double-inlet left ventricle) with hypoplastic mitral valve (9 mm, Z score = −2.44) and intact atrial septum and unobstructed pulmonary blood flow needed PA banding and creation of an inter-atrial communication. After detailed evaluation of the child and taking informed consent from her parents, the child was prepared under anesthesia as for open-heart surgery and the procedure was carried out through a median sternotomy. The patient was heparinized. A purse-string suture was made on the right atrial (RA) appendage. A stab was made within the purse string, and through this, thoracoscopy scissors [Figure 1] was introduced in the RA. Under TEE guidance, the closed tip of the instrument was used to tent the fossa ovalis below the limbus [Figure 2]a and a small perforation was created. It was then dilated by stretching with the opening of the blades of the scissors [Figure 2]b. The orifice was assessed and found to be restrictive with a peak gradient of 4 mmHg and a mean gradient of 2 mmHg. The scissors was then rotated to face inferiorly with one blade on either side of the inter-atrial septum, and two cuts were made in the inferior and lateral directions, away from the AV valves and conduction tissue, creating an orifice of maximum size 9 mm with free laminar flow across the resulting defect [Figure 3]. PA banding was done as per Trussler's formula to 27mm. The child recovered uneventfully and was discharged from the hospital on the 6 th postoperative day. The PA band gradient on the pre-discharge echo was 60 mm Hg. At 1 month follow-up, the child was well and symptom free with an oxygen saturation of 92%. The child had gained 0.5 kg in the 1 month following discharge. The follow-up echo at 1 month showed a band gradient of 50 mm Hg. 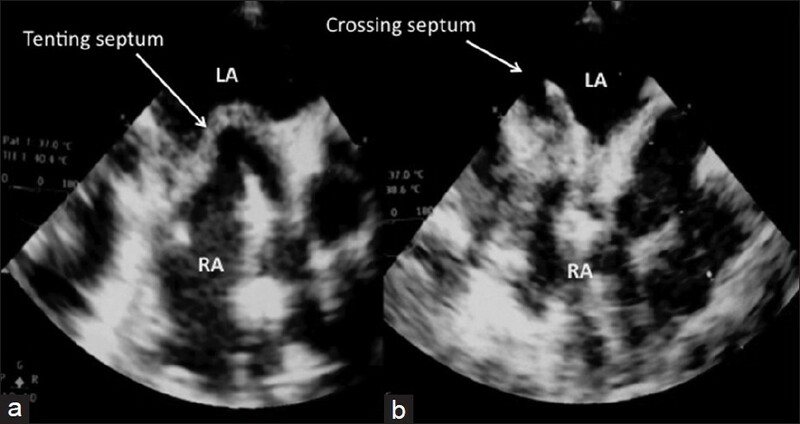 The atrial septal opening measured 9 mm with laminar flows across the defect. A bidirectional Glenn shunt is planned in the subsequent 3-6 months. Surgical procedures like PA banding, bidirectional Glenn shunt, or BT shunt sometimes need an atrial septostomy to enable good mixing or decompression of the left atrium. Traditionally, this is performed through a brief CPB run. The additional use of CPB is inherently associated with specific risks from exposure to non-endothelialized tubing with resultant systemic inflammatory response. Additionally, there is an unavoidable exposure to donor blood. Further, it is a source of considerable expense in a limited resource environment. The narrow body of the instrument requires only a small stab incision on the RA. 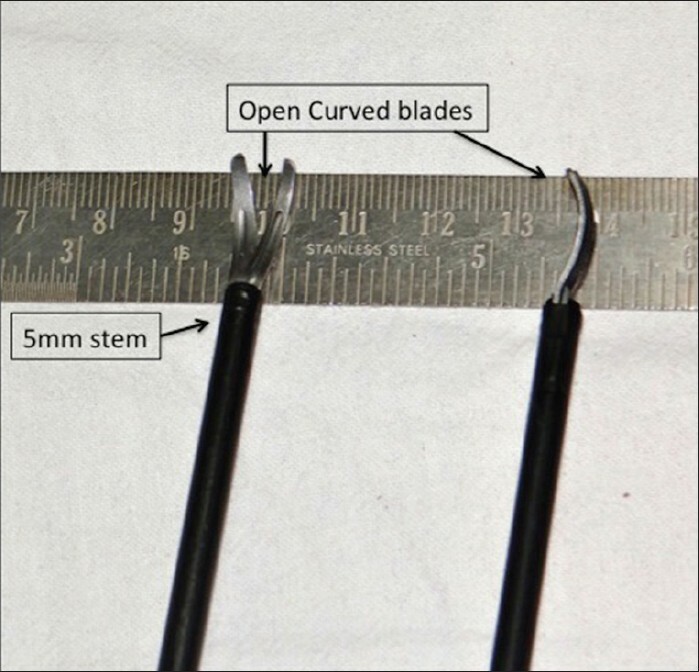 The manipulation of this slender instrument was well tolerated and there was no arrhythmia or bleeding with minimal risk. It is well controlled and visible on TEE. Avoidance of CPB is possible, with a low chance of injury to the neighboring structures. 1. Leonard GT Jr, Justino H, Carlson KM, Rossano JW, Neish SR, Mullins CE, et al. Atrial septal stent implant: Atrial septal defect creation in the management of complex congenital heart defects in infants. Congenit Heart Dis 2006;1:129-35. 2. Holzer RJ, Wood A, Chisolm JL, Hill SL, Phillips A, Galantowicz M, et al. Atrial septal interventions in patients with hypoplastic left heart syndrome. Catheter Cardiovasc Interv 2008;72:696-704. 3. Azzolina G, Eufrate SA, Pensacola PM. Closed Interatrial septostomy. Ann Thorac Surg 1972;13:338-41. 4. Simpson JM, Anderson DR, Qureshi SA. Closed atrial septostomy with Brock punch aided by transesophageal echocardiography, Ann Thorac Surg 1995;60:1794-5. 5. Kawahira Y, Kishimoto H, Kawata H, Ikawa S, Ueda H, Ueno T, et al. Surgical atrial septostomy without cardiopulmonary bypass. Ann Thorac Surg 1996;61:1016-8.